Advancements in the fields of nanotechnology and micro-fluidics have given rise to Micro Total Analysis Systems (MTAS) in recent times. These systems can perform chemical analysis of samples, just like technical analysis systems, on a small chip. This improves efficiency by reducing sample size and analytics time, while ensuring cost effectiveness. MTAS find extensive usage the medical industry, specifically in diagnostics, as well as in drug discovery and research. MTAS or Lab on Chip (LOC) devices are a type of biochips or bio MEMS (Micro Electro Mechanical Systems). LOC devices use micro-fabrication and micro fluidics to carry out sample preparation, separation and detection on a single chip. These devices also provide the benefit of portability, so that doctors and patients can get samples diagnosed without having to send them to labs. Increasing investment in Research and Development, especially in cancer research and diagnosis by the private sector and governments around the globe is likely to foster growth in the market. 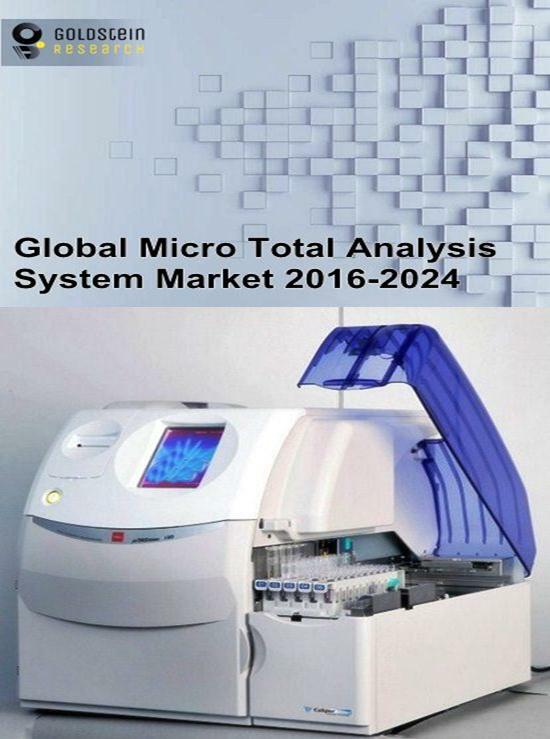 The global market for micro total analysis systems was valued at USD 4 Billion in 2016. On the back of rising demand and technological advancements, the market is expected to grow at a CAGR of 9.5% during the forecast period and reach a valuation of USD 8.26 Billion by 2024. By application, diagnostics accounts for the major market share of over 60% of the total market. Point of Care diagnostics are the most widely used application of Micro Total Analysis Systems, owing to the rising demand for easy and fast diagnosis as per the patient’s comfort. Geographically, the North American region occupies the largest share of the market in terms of revenue, followed closely by Europe. The large market size of North America can be attributed to extensive investments in research and technology by the governments in the region. In 2015, the US government announced the Precision Medicine Initiative, a USD 215 Million investment to advance the field of precision medicine in oncology. The Canadian Cancer Society funded USD 40 billion for cancer research in 2016-17 alone. Such initiatives are expected to give a spurt to the MTAS market during the forecast period. Asia Pacific is set to witness the highest growth and provide lucrative opportunities during the forecast period, owing to the concentration of geriatric population and rising awareness about modern medical devices in the region. Increasing research expenditure and the rising need for portable, high speed diagnostics are the key factors driving demand for MTAS. Number of people aged 60 years or above will increase from 900 million to 2 billion between 2015 and 2050. This global rise in the geriatric population further necessitates portable diagnosis and homecare due to issues related to travelling to and from specialized institutions among this age group. Rising demand for personalized treatment and medication will also boost demand. As per WHO, cancer was the leading global cause of death, accounting for 8.8 million deaths in 2015. This has led governments worldwide to increase investment in cancer research. As MTAS find usage in oncology, this will further drive demand for the systems. Rising incidences of various other diseases creates a large base of addressable patient population, adding to the potential demand for MTAS. Advancements in micro-fluidics and micro-fabrication technologies like PDMS (Polydimethylsiloxane) and integrated microfluidic circuits is another factor driving growth in the MTAS market. High cost of the chips inhibits mass adoption and commercialization of MTAS, thereby acting as restraints for the market. Further, issues related to standardization of systems and compliance and regulatory frameworks related to medical devices also act as hurdles for players entering the market.